Time to paint the shadows of the green candies. Again, working with the theory of relative opposites on your palette, look at a color wheel, and see which color on your palette might work as a nice, transparent opposite for the green candies. I chose Permanent Alizarin Crimson, since it is already a color I am using in this painting, it will keep the look "cohesive". Using the same technique from the previous two days, I painted the shadows of the green candies with the red under-painting. Look for areas where a crisp edge is appropriate and where you may need to soften an edge with a clean, damp brush. Be sure that your shadow areas make sense with the direction of your light source. This will not only make your painting look dimensional, but it will make it look believable! 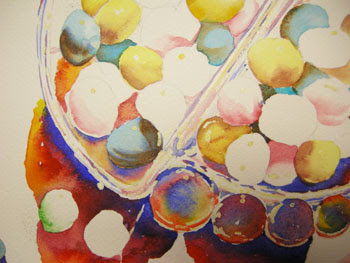 Allow to dry, then glaze each of these candies with Permanent Sap Green. Be sure to keep the glaze wet, transparent and don't over-brush!